I received a question from a reader regarding how I constructed my timelines – any special software? I looked at the writing apps that had timelines built in, e.g. yWriter and even basic notecards. They covered most of my requirements, but ultimately lacked a fourth item that I discovered along the way: flexibility! Notecards, I need to point out, was a horrible experience. I didn’t have enough space for all the cards, couldn’t keep the relationships, and most importantly, couldn’t read my handwriting.! My romantic notion of a writer staring at a cork board plastered with notecards was quickly dashed on the rocks of practicality. Until I found out how much I was missing using the Windows Beta of Scrivener and, as luck would have it, demands of my professional life gave me a great excuse to invest in a MacAir. Darn. I finished writing The West Wind in Scrivener on my new Mac but then found myself wanting to re-arrange my timelines. No, nothing really easy or cheap for importing Visio documents into Mac drawing programs that I could find. I also didn’t want to go back and forth between platforms. I wound up re-building the timelines in OpenOffice.org Draw which, as it turned out, was needed anyway due to the amount of drift from the original story timelines over the year that I wrote the story. Re-building the timelines got me back in touch with the story and allowed me to implement an idea I had for telling much of Rachel’s backstory through a couple of key flashbacks. 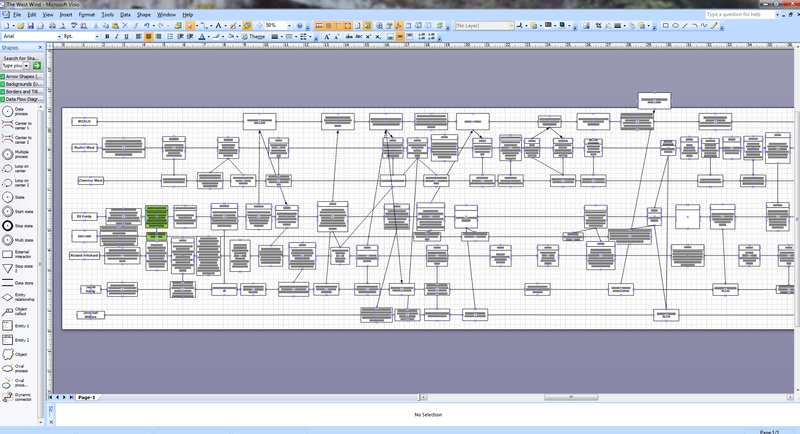 First third of the West Wind timeline in Visio. I’ve not actually used it yet, haven’t had the right project, but there’s a site called Notebook.ai that people love for world building.